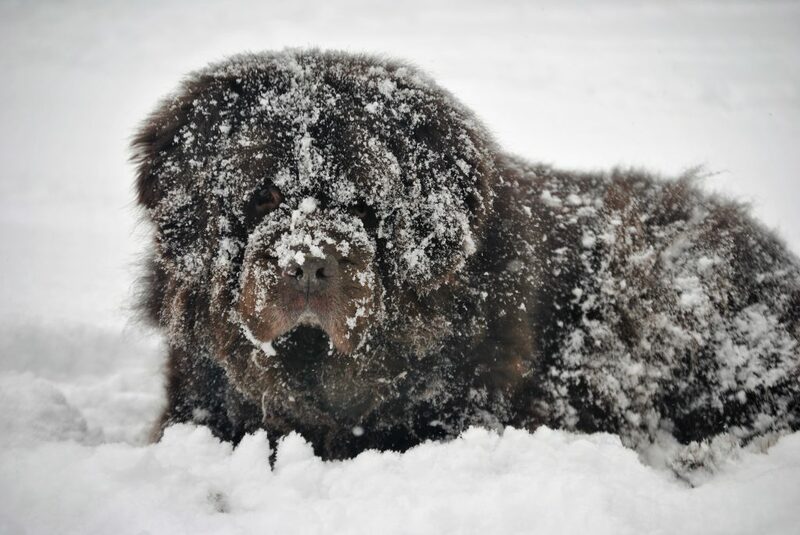 Winter is the best time of the year for many breeds of dogs, especially the Newfoundland. They will spend hours outside hanging out in snow drifts, eating snowflakes and enjoying the cool, crisp air that winter brings them. But then they get up to walk and their paws are packed with snowballs and they throw themselves to the ground trying to chew it out as fast they can. Why do snow and ice stick to dog paws and dog hair? 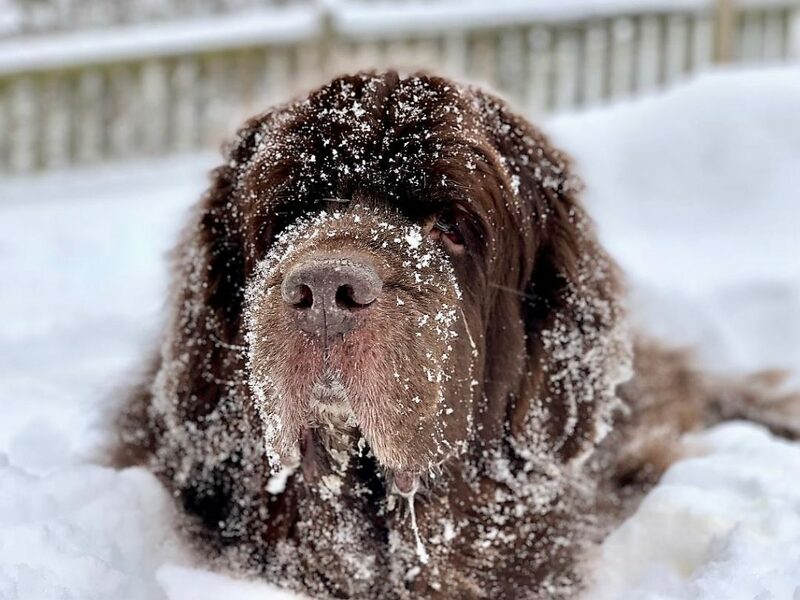 According to science, “The snow attaches to the dog’s long hair, melts from the body heat, and forms ice balls that grow larger, stretching your dog’s toes apart and causing cracking, bleeding, and hair pulling. This is painful and distressing for the dog, who may then try to remove them by licking them, which then causes even more ice to build up. Are snowballs on dog paws painful? They can be, that is why dogs limp or fall down in the ground and start ravenously chewing at their paws. We recommend not pulling out snowballs by hand or letting your dog chew them out. Pulling and chewing the snowballs will pull the hair which can be painful and cause more irritation to the paws. The more moisture that gets to the skin, the more likely it is for a dog to get yeast or a bacterial infection. Neatly trimmed hair on the top and bottom of the paws will cut down on snowballs that build up on your dog’s paws. The snow will have less hair to stick to thus creating fewer snowballs on the dog’s paws. 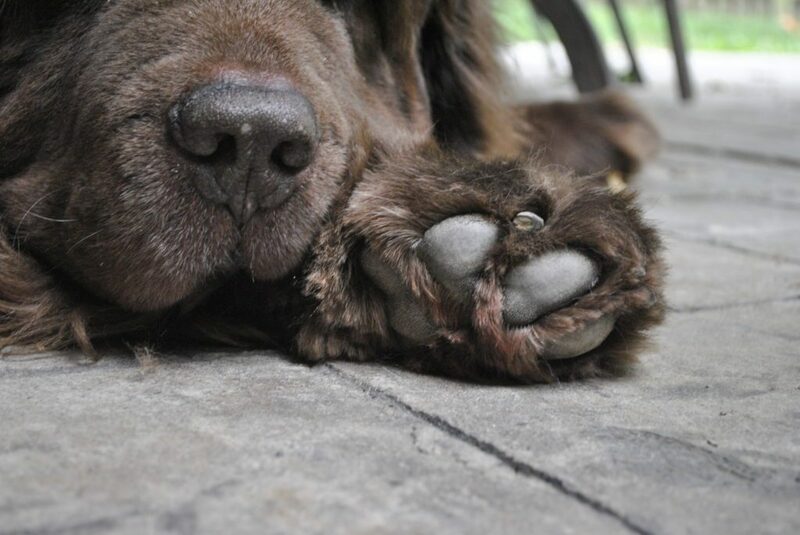 For Newfies, and other long-hair breeds, we recommend digging into your grooming tools and using thinning shears or straight shears to trim the paws. Thinning shears can be used for the top part of the paw and for the bottom, you can use straight or thinning shears. Keeping your dog’s nails trimmed will also cut down on places for snowballs to get stuck. The underneath of a long nail is a perfect spot for ice balls and snow to get stuck under. Dog boots are a great way to combat snowballs on dog paws. They come in a variety of sizes and easily slide on the paws of most dogs. 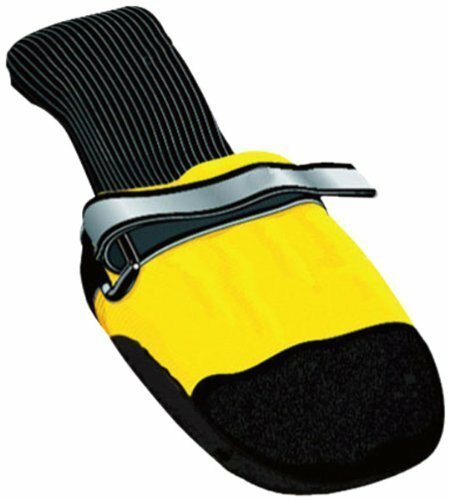 We use MuttLuks here but PAWZ boots are also used by many dog owners. The catch is that some dogs are not fans of having something on their paws and many will refuse to walk or walk funny for a while until they get used to them. Paw balm is our personal choice for battling the snowballs. The balm will protect a barrier between the hair on the paws and the snow so the snow won’t collect in between the pads and on the hair. You can buy Mushers Secret paw balm online or in many retail stores or you can use bag balm. 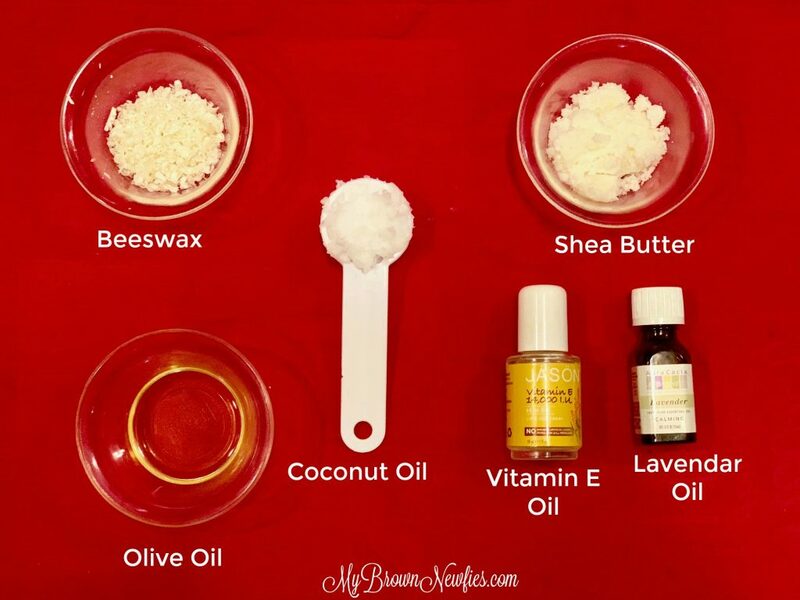 There are also many DIY paw wax recipes online that you can make right from your own home with few ingredients and it does not leave paw stains on your floor. When you have the paw balm of your choice simply apply some to all 4 of your dog’s paws before heading outside. I’ve heard many people also use Vaseline or non-stick spray Pam on paws but this didn’t work well when I tried it and it actually made their paws slick on ice. If you don’t want to deal with any of the above, a plastic bowl or bucket of warm water will also work well to remove snowballs from dog paws. Keep a bowl by the door and fill it with warm when your dog heads outside or use your DIY Muddy Paw Wash Station as a snowball remover! When they are ready to come back in simply dip each paw individually in the bowls and then gently dry with a towel. The snowballs will melt away fast! We recommend making sure that you’re checking your dog’s regularly in the winter time. Make sure to check in between the pads for mats that may form and check for any redness or irratation. The poodles tend to get snowballs in their paws (so did the sheepdogs) so grooming is a necessity. When the snow is really deep we have to rely on boots. Naturally they don’t like them, but it keeps the balls from forming and the pads save from salted walkways. We haven’t had any snow here yet; but I’ll definitely keep this in mind! We don’t usually stay outside all that long anyway, but I do need to trim Shadow’s paws soon. I didn’t realize how bad snowballs on paws could be for them. I’m moving the paw wax to the door so I don’t forget to put it on as we get snow this Winter. Thanks for sharing these great tips. Awesome ideas! My Golden gets these a lot in winter!